This matzo ball soup, made with roasted chicken stock, carrots, celery, and matzo balls, is soothing and satisfying. An elegant addition to a Passover meal, or the perfect meal to gift a sick friend. 2. Before you begin, keep in mind, if you prefer a larger ratio of broth to matzo balls, double the chicken stock ingredients as the matzo balls soak up quite a lot of broth during cooking. Place the chicken bones on a rimmed baking sheet and roast, turning the bones halfway through cooking until the bones are golden brown, 40 to 45 minutes. Take care to not over-brown the bones as if they’re roasted too dark, your stock will turn bitter. Transfer the roasted bones to a large stockpot. 3. Peel and halve the onions. Halve the whole carrots and celery stalks. Place the onions, carrots, and celery on the baking sheet the chicken bones were roasted on. Turn the vegetables to coat them in any fat that may be left on the baking sheet. Roast the vegetables for 15 minutes. 4. Transfer the vegetables to the stockpot. Discard any drippings from the baking sheet but scrape any browned bits on the bottom of the pan into the stockpot containing the chicken bones. Add enough water so that all the bones and vegetables are submerged. You’ll want to use at least 6 cups and perhaps a couple cups more (1.4 l or more as needed). 5. Trim the parsley stems from the leafy tops. Toss the stems in the stock and reserve the leaves for another purpose. Then add the black peppercorns and bay leaf to the stockpot. Bring to a gentle boil and then immediately turn down the heat and maintain a very low simmer until the stock has reduced by about a quarter, 30 to 45 minutes. Skim any foam or scum that forms on the surface of the stock as it simmers. Strain the stock into a clean, large stockpot and let it cool. 6. While the stock is simmering, in a medium bowl, mix the matzo meal, onion powder, garlic powder, baking powder, and 1/2 teaspoon salt. 7. In a small saucepan over low heat, melt the duck fat. (Alternatively, you can melt the duck fat in a microwave for 30 seconds.) In a medium bowl, whisk the eggs until combined, add the duck fat, and then whisk again. 8. Stir the wet ingredients into the dry ingredients and mix thoroughly until the mixture starts to thicken, 1 to 2 minutes. Cover the matzo ball mixture and refrigerate for 30 minutes. 9. Line a plate with wax or parchment paper. For large matzo balls, using a large spoon, scoop up a heaping amount of matzo mix (about 1 1/2 ounces or 42 grams), roll it into a ball, and place it on the plate. If the matzo balls stick to your hands, slick your hands with a little oil. You should end up with 6 to 8 matzo balls that are roughly the same size. Cover and refrigerate the matzo balls for 30 minutes. For smaller matzo balls, using a large spoon, scoop up a heaping amount of matzo mix (about 1/2 ounce or 15 grams), roll it into a ball, and place it on the plate. If the matzo balls stick to your hands, slick your hands with a little oil. You should end up with at least 18 matzo balls that are roughly the same size. Cover and refrigerate the matzo balls for 30 minutes. 10. Bring the chicken stock to a simmer, season with salt, and add the matzo balls. Cover the pot and gently simmer (if it’s a rolling boil the matzo balls will fall apart) until the matzo balls have floated to the surface and are no longer egg-y in the center when you cut into one, 12 to 20 minutes, depending on the size. Don’t be surprised when the matzo balls double and perhaps triple in size as they soak up the broth. Gently stir in the sliced carrot and celery for the last 2 minutes of cooking. 11. Place 1 large matzo ball or several smaller matzo balls n each bowl, ladle the chicken stock with carrot and celery over the top, and garnish with chopped dill. These matzo balls are unbelievable! The combination of spices and duck fat made these the best and most flavorful matzo balls I've ever eaten. I doubled the recipe and served this soup as a first course for 10 guests and they went crazy over it. They were demanding more soup! The broth needed additional bouillon but was delicious once seasoned. It's a very pretty bowl with the sliced carrots and the dill is a wonderful flavor and garnish for this soup. After mixing, I tried the dough. Oh my gosh I could've eaten it raw it was sooo good. I refrigerated it for 2 hours. I tried one matzo ball at a simmer and it disintegrated. The soup needs to be at a boil. I knew they were done when they floated up to the top. I did not cut one. I just knew they were done instinctively. The dill garnish was excellent. It added a special flavor. This matzo ball soup is actually a very straightforward recipe to follow. I found the order and timings more or less as the recipe described. This is soul food and wonderfully warming and simple. I really enjoyed the flavor of the dill and the thinly sliced carrot. Great for a very light meal or for comfort food when you are cold, tired or poorly and equally good for a starter for a dinner party that will be followed by something heavier. The only change I would make to this recipe would be to add gizzards (not the liver) to the stockpot and a few extra chicken necks. I make my own chicken broth and this really does add depth of flavor that can't be found without it. I liked the idea of roasting the bones followed by the vegetables being coated in the excess fat. This is something I will copy for my own broth. I don't think I used enough parsley stems so would probably triple the amount next time I make it. I didn't follow the instructions step by step. I found that while the bones were roasting, I chopped the vegetables and I also mixed the matzo ingredients together and popped that in the fridge. 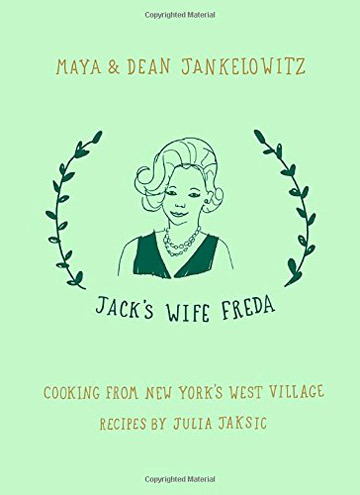 Matzo Ball Soup Recipe © 2017 Maya & Dean Jankelowitz. Photo © 2017 Henry Hargreaves. All rights reserved. All recipes and photos used with permission of the publisher.